Grade 1 (first degree): the most common sprain, requiring the least amount of treatment and recovery. The ligaments connecting the ankle bones are over-stretched and damaged microscopically, but not actually torn. Grade 2 (second degree): the ligament damage is more severe (often partially torn), but there is no significant instability. Grade 3 (third degree): the most severe sprain, typically associated with torn ligaments and ankle instability. Sprains occur when the ankle is twisted unexpectedly in any direction that is in excess of what the ligaments can tolerate. Typically, that happens when running, jumping, making sharp direction changes, or stepping on uneven ground. The most common torn ligaments are on the outside of the ankle. As a result, this area is often the most swollen and tender. In more severe sprains, you may tear the inner ligament (deltoid ligament) which will cause pain and swelling at the inner ankle. After a severe sprain, it may be difficult to bear weight on the foot for several weeks. program to help you recover. Most people completely recover from an ankle sprain. A small number of people have either persistent pain (more than one year after the sprain) or recurrent instability (frequent sprains). In these scenarios, surgery may be required. 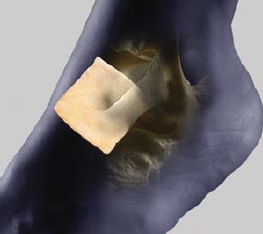 The goal of surgery is to re-attach and tighten the ligaments. The specific approach will vary according to your particular condition. At the same time, you may have an ankle scope or keyhole surgery to the ankle joint to have it inspected for damage and/or to remove any inflammatory tissue (which contributes to pain). Your leg will be in a cast for several weeks. Keep your cast dry! If the cast gets wet, the skin underneath stays damp and can become mouldy and smelly. To keep your cast dry in the shower, enclose it in a plastic bag, or buy a special cast protector. If the cast and the underlying dressing get wet, contact your surgeon’s office or go to your nearest emergency department to get your cast checked. You will be instructed on caring for your cast, and if and how much weight you can bear on the foot. Watch for complications. Alert your surgeon or visit an emergency room if you experience pain that does not subside with prescribed medication, swelling that worsens (or the cast becomes too tight and you notice loss of colour in your toes), and/or have a fever higher than 38°C or 101°F. You will gradually be allowed to bear weight on your ankle as your recovery progresses, and your surgeon will prescribe physiotherapy. Physiotherapy is very important because it helps to strengthen your peroneal muscles and return your reflexes to normal. You can begin exercising about 6 weeks after surgery but talk to your surgeon and physiotherapist before resuming running or other higher intensity sporting activities.